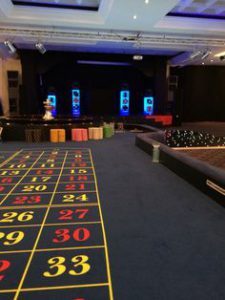 40th Birthday Casino Party at Priestfield Stadium: We were contacted by our client about 6 weeks before. A lifelong Gillingham fan that knew the only place for her 40th was going to be the Stadium. After having spoken on the phone to confirm the booking we then met at Priestfield Stadium to clarify where the Casino would be on the night. 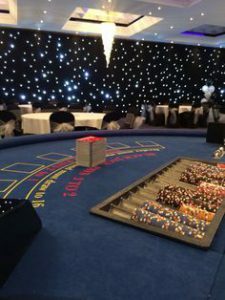 On the night we arrived well before the guests to ensure all was set prior to their arrival, we put in 3 tables for the Casino Party, 2 x Black and 1 roulette. Access to the venue was simple and the venue staff were great too. Guests were met on arrival and given $200 (Class Casino Dollars) and informed of the Casino and the bottle of Moet Chandon for the winner. Guests who were unsure of how to play were all talked through by the professional croupiers on the tables. Then the games began with lots of noise when people won and not so much when the numbers didn’t hit. But fun was had by all, a great night with a fantastic review on our Facebook page. 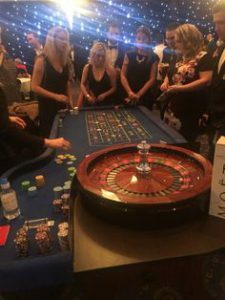 If you are looking to have a Casino at your Party please get in touch we are very proud of the events that we do with nothing but 5* reviews. Call us now on 0845 591 1398 or complete the booking form here.